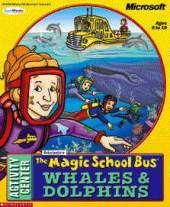 Get ready for a whale of a time with Ms. Frizzle and her class as you join them on a field trip to the Pacific Ocean. With The Magic School Bus Whales & Dolphins Activity Center, kids ages 6 to 10 experience whales and dolphins up close and personal, and find out where they live, what they eat, and other amazing science facts. There are plenty of activities to keep kids entertained all while learning about these giants of the sea, including art activities, arcade-style games, and science experiments. Kids learn important science concepts through activities hosted by characters from the Magic School Bus TV show. The activities strive for an equal balance of fun and learning, to satisfy kids' desire for fun and parents' desire for education.